On Monday school (sadly) started again I am glad though because that means dance has started again and I’ve been able to ski! It snowed a ton while I was back home in California so I was sad I didn’t get to ski when school was out. It hasn’t snowed as much as it did over winter break since I’ve been back but it has snowed a little bit which is better than nothing, right? Sometimes my friends think I’m crazy because I love snow so much. None of them ski though like I do. Well sometimes Amberly or Izzy come with me but not often. Snow makes for great photo opportunities though and looks a lot better than the same drab background you always see on here. Doesn’t the background look so much better? 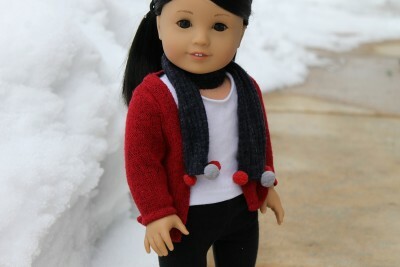 I also love the contrast with the black and red that Evie is wearing against the snow. I would describe Evie’s style (for the most part) as comfy and casual like the outfit you see here. Evie is an actress though so sometimes she loves to dress up in crazy outfits. Like for example before break, one day she came to class wearing an colonial style dress. She didn’t wear one of the crazy frilly style of dresses, hers was much simpler, though it was still surprsing to see her come to class in it! Here Evie is wearing a red cardigan from Our Generation. This cardigan is one of Evie’s favorite clothing pieces as she wears it often. I can’t blame her though, it’s adorable! Evie paired the cardigan with a pair of simple black leggings from American Girl and a plan white top that I had made back when I used to sew. The boots and scarf are the perfect accessories for this outfit. 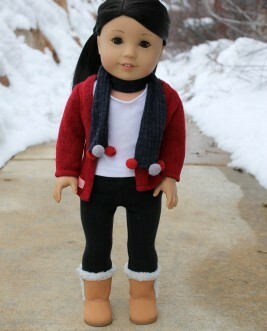 The scarf is also from Our Generation and the boots are from American Girl. 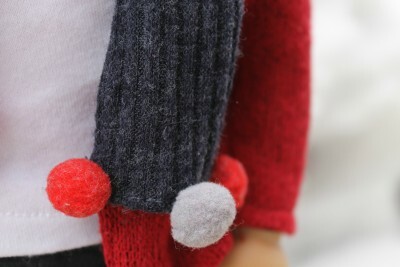 Aren’t the pompoms on the scarf the cutest? I love them! One last photo of Evie in this adorable outfit! I think it’s one of my favorites for days like today where it’s chilly but not too cold. What do you think?